I don't know about you but if I could have a personal stylist I would be ecstatic! Well...I can't offer you a personal stylist but I did just recently discover fab kids. 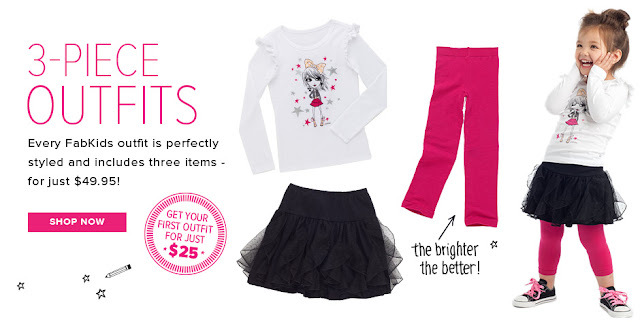 It is a website that offers monthly ready-to play outfits for stylish girls. When I first came across the fab kids website, I was so excited! I had never seen such a thing. I couldn't wait to sign up. You fill out a survey so that they can get an idea of what your girl like's. From there they customize very cute head-to-toe outfits. It's a personal stylist for your girls! This is a great option for busy parents or just parents who want great stylish finds. This website was also launched with actress and mom, Christina Applegate. All outfits are just $49.95 and the first outfit you purchase is just $25. You can't beat that!